The term K9 usually refers to a Police Dog. As some of you know, I’ve been a police officer since 1984. 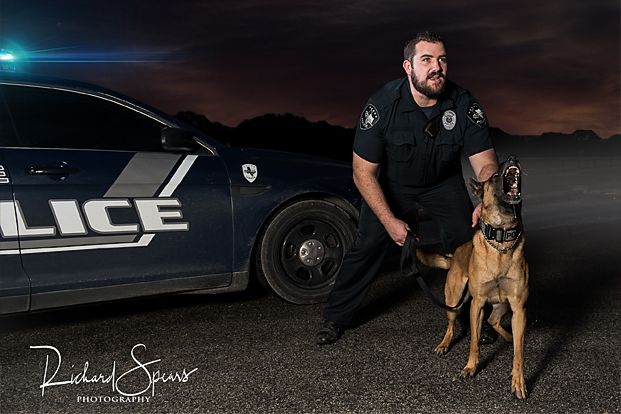 As a photographer I’ve wanted to do a shoot with a K9 team for a long time, and it just never worked out. 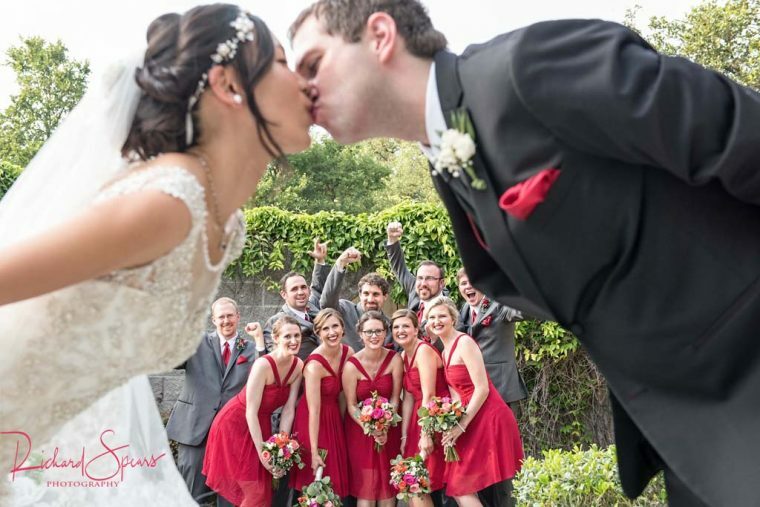 Last week, I did it, and I’m very proud of the images. Let me back up just a bit and tell you one of the reasons I’ve always been so intrigued by police K9 units. I started out at the Amarillo Police Department in the northern panhandle of Texas. 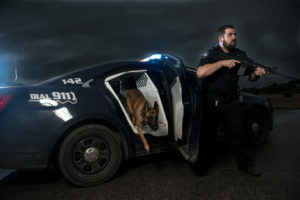 At the time, Amarillo had one K9 team. The handler was Cpl David Abraham. His partner was “Risky Chance”. Risky was a German Shepherd. 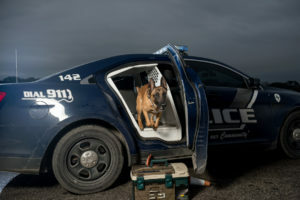 Most of the K9’s you see these days are the popular breed Belgian Malinois. When I was a rookie officer, I was sent to a burglar alarm at a bowling alley. First officer on the scene felt that the burglar(s) were still in the building, and requested K9. My FTO (field training officer) and I set up on the front side of the building. The forced entry was in the rear of the building. When Abraham and Risky arrived, I heard Risky barking loudly… a bark that gave me chills at the time. Abraham called out inside the bowling alley for the subjects inside to come out or he would release the dog. No answer. After two more warnings, Abraham released the dog off leash inside the building. There was a brief moment of silence, and all I could hear were the sounds of Risky running through the building. Then I heard a loud growl, and intense barking, and someone yelling. A moment later, a saw a young guy run through a plate glass window near where I was standing. Risky was hot on him, and took him down, biting him in the _____ … let’s just say it was a sensitive area between the legs. It was literally the most awesome thing I’d seen. I wanted to be a K9 officer. It’s 30+ years later, and the desire to be a K9 officer is still with me. I’m too old now. Dog handlers have to be in good shape to keep up with their 4-legged partners. One of the officers that I currently work with has a great dog. I asked him if I could do a photo session, and he agreed. 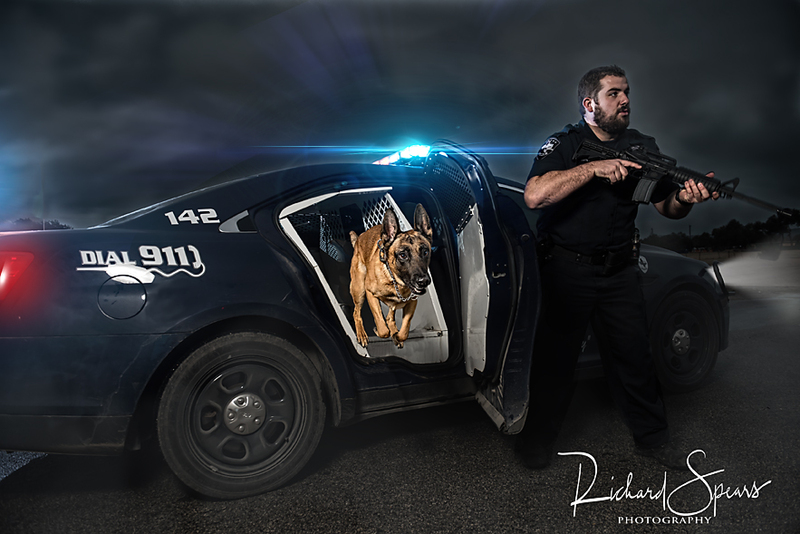 I wanted to do an action shot of the dog (named Chak) leaping out of the patrol car. I asked Josh (Chak’s handler) if Chak would stay in the car until he got the command to jump out, and he said “of course”. We set up the first shot, and everything looked good, except when Chak got the command, he casually stepped down out of the patrol car. Chak casually steps out of the patrol car. I had a talk with Chak, and told him I wanted him to LEAP out of the car like … “SUPERDOG!” I told him we’d try again. And again. And again. Attempts 1-7 were about the same. We finally decided to put some props on the ground so Chak would have to jump over the items. It worked. I ended up having to do a composite. I cut Chak out of the one picture I had of him leaping, and put it in one of the good pictures from the beginning. Added some fog, worked on the strobe light, and had a picture I liked. Convincing Chak to LEAP. Notice the ID kit, and traffic cone.